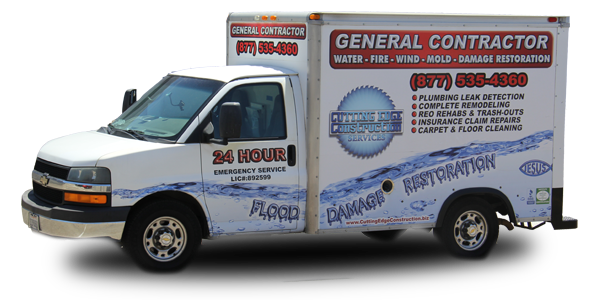 Has your Hemet home or business just experienced water or fire damage? Cutting Edge Construction is the one company that can handle it all, professionally and with the best in customer care. We’re licensed and insured, certified by the IICRC (the leading international cleaning and restoration organization), and members of the CRA (Cleaning and Restoration Association. A timely response is critical to avoid further damage; our expert technicians are available for emergency service 24/7 throughout Riverside county. Cutting Edge is experienced in every aspect of flood and water damage removal, leak detection, and fire damage repair. We don’t just take care of the building. Our services include all of your affected property. We can even arrange hotel accommodations, all bundled into one service package. These services require a surprising amount of specialized knowledge, so only trust experienced, well-trained, and certified technicians — like those at Cutting Edge. To make this very stressful time for you a bit more tolerable we’ll work directly with your insurance company. Not just helping with paperwork, but using our years of experience to provide all the proper mitigation steps to qualify for coverage. Plus, you face no up-front payment. We’ll wait for your insurance company’s payout. There’s no need to panic or feel overwhelmed. Just call Cutting Edge Construction for a prompt assessment and quotation, and truly professional restoration services. You’re not likely to experience storm flooding in Hemet. But a burst pipe, ruptured water heater, or sewage backup can flood your home or business. Our well-trained technicians are equipped with rapid pump-out gear to remove standing water and contamination. We’re also on the ready to take care of any sanitation issues, perform water damage removal, and then complete any and all repairs. Mopping and even shop wet-vacs are often not enough, even for relatively small overflows and leaks. Water quickly penetrates deeply where it’s very hard to reach. That lingering water and moisture can lead to lasting damage, both visible and hidden, including health-hazards of mold, bacteria, and virus growth. Our water damage removal specialists employ special water-extraction equipment as well special dehumidification gear to assure rapid and thorough building dry out. In addition to the building itself, we take care of carpet cleaning, furniture, odor control, and mold remediation. You may not know where that water damage is coming from. It might be a roof leak or a plumbing leak hidden within the wall, above the ceiling, under the floor, or out in the yard. Don’t tolerate a plumber that makes multiple holes in your home or business in an effort to locate the problem. At Cutting Edge we use the best electronic leak detection and thermal imaging to pinpoint the leak, often before it causes any significant damage. If you’ve had a fire you’re probably feeling overwhelmed. Beyond the horrifying appearance of the fire damage itself, smoke and soot spread throughout the building and there’s likely water damage from fire fighting. Our extensive training and numerous certifications mean that Cutting Edge is one company that can handle everything, from assessing and documenting damage to the final fire damage repairs and returning everything to pre-fire condition. Smoke and soot are particular problems. There are actually several different types. Some are corrosive and damage household items if not quickly and correctly removed. All pose serious odor problems for building surfaces, furniture, drapery, and just about any porous material. If not removed immediately and thoroughly compounds in the smoke will penetrate deeply and cause odors that can linger for years. We’re proud to bring the best in leak detection services, water and flood damage removal services, and fire damage repair to Hemet’s population of 78,657 residents (2010 census) and countless businesses. It all started with the 1842 land grant. Then the formation of Lake Hemet by the Hemet Dam in 1895 provided water for agriculture, fueling the city’s growth. The city became home to California’s first outdoor play, the Ramona Pageant, starting in 1923. During World War II the city was home to the Ryan School of Aeronautics where some 6,000 Air Force pilots received their training. We then experienced rapid growth in the 1990s as a lower-cost alternative to other locations in the region. Perhaps former resident Bill Murray sums up the areas tone with his down-to-earth attitude and love of every-day people.